Is a Heat Pump More Effective at Cooling or Heating? One of the main reasons that homeowners have heat pumps installed in the first place is because they provide a fantastic “two-in-one” package deal: an air conditioner and a heating system. It only takes a single adjustment on a thermostat to change a heat pump from heating mode to cooling mode and vice versa. But are heat pumps equally effective at heating as they are at cooling? It’s a question people often ask, and we’ll address it below. The simplest answer to the question is that heat pumps are more energy efficient in cooling mode. The standard SEER rating for a heat pump (the efficiency rating for cooling mode) is around 5 higher than its HSPF rating (the efficiency rating for heating mode). The reason for this is that a heat pump must draw heat from outside when it is in heating mode, and since people only use the heating mode during cold weather, there isn’t an ample supply of heat for it to absorb. The heat pump therefore has lower energy efficiency in heating mode. However, this shouldn’t dissuade you from considering a heat pump for your home, because unless the weather drops below freezing, a heat pump is still more energy efficient than a combustion system heater (such as a gas furnace) or electrical resistance heater (such as an electric furnace). 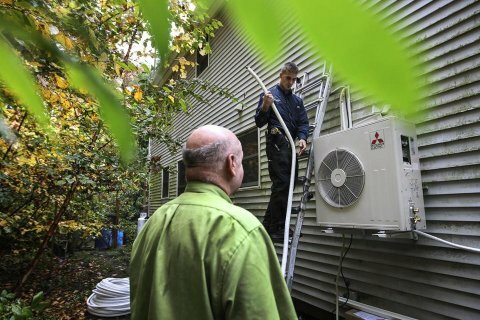 For most homes in the Cary, NC area, a heat pump can provide the right level of comfort for the winter and end up costing less to run than other alternatives. Plus, you have the benefit of cooling that is as powerful as any air conditioner of comparable size. Heat Pumps are more efficient than Hair Dryers! Two(2) years warranty on pump motor. One(1) year warranty on rotor. Quiet Startup & Operation. Water pump not Skimmer Version. A chiller boiler system is a chiller, boiler, pumps and HVAC controls in a single pre-engineered package. This reduces complexity for the field installer and increases the simplicity of installation overall. Most chiller boiler packaged systems are designed for large residential and small commercial structures.